Posted on November 5, 2014 by Michelle M.
On Monday, October 27th we lost our little Gordie. 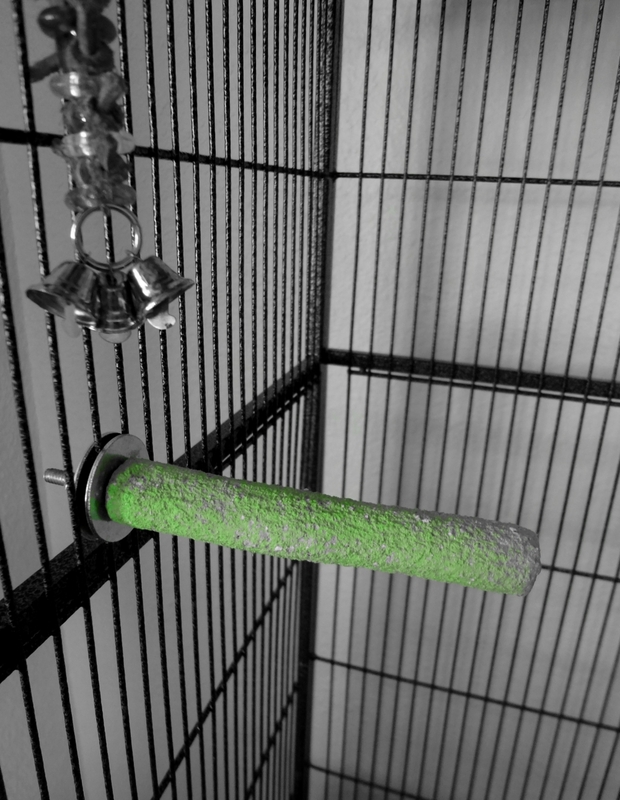 That morning I was cleaning the cage when I heard a loud squawking. I turned around and saw Gordie on the bottom of the cage upside down and fluttering his wings. I picked him up and he died immediately in my hands. We think it was a seizure or heart attack. Gordie was an older budgie. We never really knew how old he was. We were his third (possibly fourth) home. His last owner estimated him at five, but he could have been (and we suspect he was) much older. When we first brought Gordie home, he just sat on his perch looking at himself in his mirror. He didn’t play with his toys, move around much or call out to the other budgies. He wasn’t finger tame (but would sit on our shoulders). His previous owner told us that the family who gave her Gordie thought he was “boring”. Gordie became a different bird once his quarantine was up and he moved in with the flock. He bonded quickly with his lookalike Ozzie. We think Ozzie was “the bird in the mirror” finally coming out to play. With patience, Gordie started stepping up. He expressed interest in what the other budgies were doing, playing with toys and nibbling on veggies and millet. Gordie became interested in us as well. If we stood by the cage, he would make his way right up to the bars to see us. He was the only budgie who did this. I think he liked kissy noises and being told what a good budgie he was. And he was a such a good little budgie. When Gordie’s flight feathers started coming in he began to make the voyage from the cage to the little play gym on top of the bookcase. He really enjoyed being up high and would happily sit on his “gym” chirping to himself or the other birds. It took a lot of effort for Gordie to fly about. It could have been his age or perhaps he never had the chance to fly before. One of his wings was a little crooked – maybe that made it more difficult to fly. In any case, sometimes I would give him a little ride on his play gym back to the cage. Gordie also “hobbled” when he walked up and down on the perches. He was a little slower than the other budgies, but did his best to keep up with his friends. We were thrilled when Gordie bonded with Lera. They were an adorable pair, constantly grooming each other. When Lera was ill, Gordie was so sweet and attentive, feeding her and cuddling with her on the bottom of the cage. I think he was key factor in her amazing recovery. Gordie loved to take baths. When he was finished he liked to sit on the rim of the bird bath and gaze out the window. One day he even plopped himself into my water glass. He had great fun climbing out and dunking back in. Gordie also liked his green perch (above). If he wasn’t by Lera’s side, that was his spot. I think because Gordie was an older budgie, he had a special place in our hearts. We wanted so much to give him happiness in his golden years. He was a sweet little fellow and we were lucky to have been able to share the short amount of time with him that we did. Seeing him playing, flying and interacting with the other budgies brought us so much joy. I just wish we had been able to have more time with him. We love you Gordie and miss you more than words can say. This entry was posted in Gordie and tagged Cooper, Gordie, parakeet by Michelle M.. Bookmark the permalink. Oh Noooo – I am absolutely Heartbroken. Gordie was such a cute, handsome little man; a real Gold Star Budgie, if there ever was one. I loved reading your tribute to him – He was very dear. I am so thankful you rescued him, and gave him the greatest home a little budgie could ever have, including a best budgie buddy in Ozzie, and the lovely Lera. Thank you so much. He was indeed a “gold star” budgie. We tried to give him a lifetime of love in the brief time we had with him. I am so sorry to hear about Gordie’s passing. Bless you for giving him such a loving home though! Thank you Christine – that is sweet of you to say <3. Such sad news to hear, I am so sorry! Our little budgies are so fragile and yet they act so tough and fearless. I am snuggling close to Bert and Ernie tonight as I read this. So glad he had the best flock any budgie could wish for with you and yours! Thanks to you he was loved and will be remembered. Thank you Karon. I think when you have a budgie you have to cherish every day with them. Bert and Ernie are lucky to have you <3. What a darling tribute. Made me a bit teary. I’m he experienced the best years of his life with you guys. Hugs. Thanks Tam. Hugs back : ). I’m so sorry to hear about your family and flock’s loss. You gave him such a sweet tribute. And he was definitely very loved and it’s great to hear how you gave him such a lovely home in his older age! Thanks Alexa. Gordie was a darling and we were lucky to have him in our lives. Your post clearly shows that you and Harry were loving and attentive parents. Gordie was as lucky to have had the time with you as you were to have him. Thanks john. I hope we gave Gordie half as much joy as he gave us. He was so lucky to have you. My heart breaks for you. Thanks Susan <3. He was such a sweet, gentle little guy. It's not the same without him. He was so very lucky to have you guys in his life. No matter how old he was, he deserved a forever home, and you did well in giving him just that. Gordie is waiting for you at the rainbow bridge, and he is watching over you. Aw, thank you. Definitely always loved and never forgotten. This post really touched my heart. You did give him the wonderful golden time that so few pet budgies get… the bird in the mirror coming out to play- that is so moving and poignant. I agree – they all do have their own unique personalities and quirks. Aww, I just read the sad sad news :(. oh no… this makes me so sad… Gordie was a sweet little guy. His story is so nice, being a lonely only and then have such a nice budgie family. Maybe going so quickly was a good thing, he was happy til the end. I’m going to give my budgies extra millet today in honor of Gordie. Thanks Serena. He was the sweetest. I’m sure he would have loved the millet tribute <3. Thanks for the sweet words Iva <3.